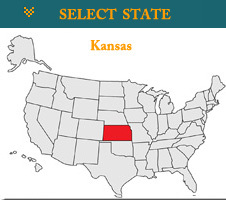 Kansas.How to Get a Kansas CDL License? Individuals interested in obtaining work as a driver may need to get a commercial driver’s license. Drivers of big rigs, school buses, passenger buses and other large vehicles need to get a Kansas CDL license before operating such vehicles on the Kansas roads. The Kansas Department of Revenue Division of Motor Vehicles (DMV) issues CDL licenses to Kansas drivers. Applicants must first pass a written knowledge test to get a Kansas CDL permit. They can then train on commercial vehicles and prepare for the hands-on skills exam. Those who pass both parts of the exam can get a Kansas CDL license from the DMV. Access the “Kansas Commercial Driver License Manual.” You may get a copy at the local Kansas DMV or access it online at the Kansas Department of Revenue’s (DOR) website at Ksrevenue.org/dmvcomhandbook.htm. This Kansas CDL manual provides the information necessary to pass the written knowledge test. You must study the general portions plus the knowledge for any endorsements you need. Endorsements are special designations for operating specific vehicles or cargo like HAZMAT or passenger vehicles. Study for the parts of the knowledge test that apply to the vehicle you will be operating as a commercial driver. If you are not sure about what kind of job you will be getting, the best thing to do is just study and take all endorsement tests. This will expand your options for driving jobs in Kansas after you get your CDL license Study the manual and take your knowledge exam at the local Kansas DMV. You can also supplement the Kansas CDL manual with other CDL study guides or practice questions. For example, CristCDL.com has some practice tests you can use to prepare for your Kansas CDL exam. You can look for other CDL study resources by searching in a search engine.